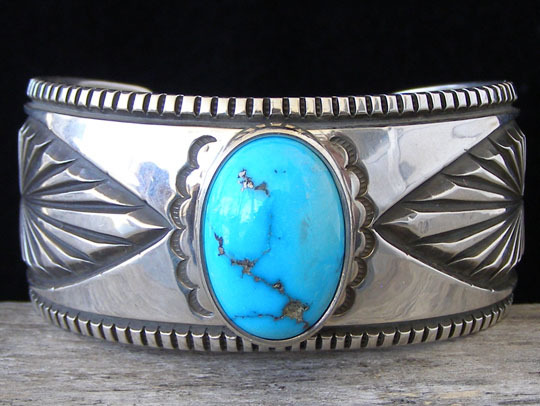 Harrison Jim Morenci Turquoise Sterling Ingot Bracelet size 7"
Not quite forty years old, Harrison Jim is an accomplished silversmith who works in many styles but favors the classic designs best described as Navajo Traditional Revival. His work is done in the old-fashioned way by melting silver, rolling it out and hammering it to form his pieces. This splendid piece is set with a high-domed, Persian-style cut of natural, untreated Morenci turquoise from Arizona. The cuff is shaped to soft convexity. The large-pattern decorative elements spanning the sides of the cuff to the terminals is wholly free-hand cold chisel work. An oxidizing agent was used to make the stamp and chisel work darker in the textured recesses, then the piece was buffed to a high shine. The cuff tapers gently to the terminals. Hallmarked with a capital "H" on the exterior of the cuff near the terminals. Width of cuff at center stone: 1 1/4"
Width of cuff at terminals: 7/8"